Taken from a press release from City Of Wolverhampton Council. Young people living in Wolverhampton can enjoy a range of free summer activities on offer across the city. HeadStart Wolverhampton is working with Gazebo Theatre, the WV10 Consortium and YMCA Black Country as well as other local community organisations to offer an extensive summer programme for young people and their parents or carers. The programme, designed to support the emotional wellbeing of young people and families through free fun activities which boost confidence, encourage teamwork and develop new skills, is open to 10 to 16 year olds living in the four HeadStart areas: Low Hill, The Scotlands and Bushbury South; Springfield, Heath Town, Old Heath and Eastfield; All Saints, Blakenhall, Parkfields, and Ettingshall; and Bilston East. Young people in Low Hill, The Scotlands and Bushbury South can enjoy arts and crafts, dance, music and big screen gaming sessions, with activities taking place at Low Hill Community Centre, Big Venture Centre and Park Village Education Centre. While their children take part in activities, mums can enjoy pampering sessions at Big Venture Centre while there will also be messy play sessions for siblings aged up to five. In Bilston East, young people can enjoy family film events, trips out and multimedia sessions at Bilston Town Hall, while Gazebo Theatre is holding The Play in a Week from 20 to 24 August, with a showcase performance on Friday 24 August. Children and young people in the two other HeadStart areas - Springfield, Heath Town, Old Heath and Eastfield; and All Saints, Blakenhall, Parkfields, and Ettingshall - can enjoy sports, arts and crafts, cooking sessions, family coffee mornings and more. For more information, and for a full timetable of activities, please visit HeadStart - What's On. Although all activities are free, places are limited. HeadStart Wolverhampton's summer programme is just part of a wide range of exciting activities for children and young people aged 0-18 taking place in Wolverhampton over the next few weeks. Highlights include the Digital Creators Club, hosted by the City of Wolverhampton Council's Learning Technologies Team at Central Library, where young people will be able to re-create their favourite Harry Potter scenes using pixilation-style animation, create robots from Lego and show off their writing skills for a chance to be published. Also at Central Library, younger children can enjoy story, craft and fun with numbers sessions, and there's a chance to attend special workshops with Beano artist Laura Howell, part of Wolverhampton Library Service's Summer Reading Challenge which is now underway. 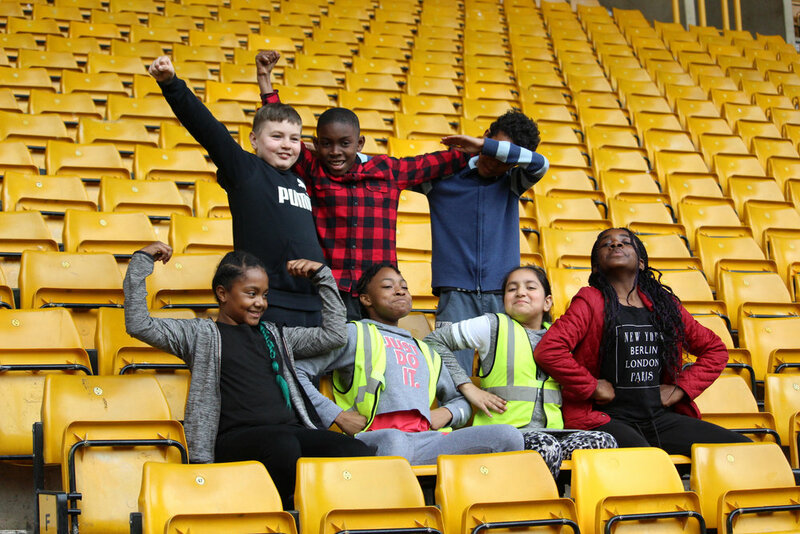 Once again Wolverhampton’s young people have a jam packed programme of fun and engaging activities on offer this Summer. 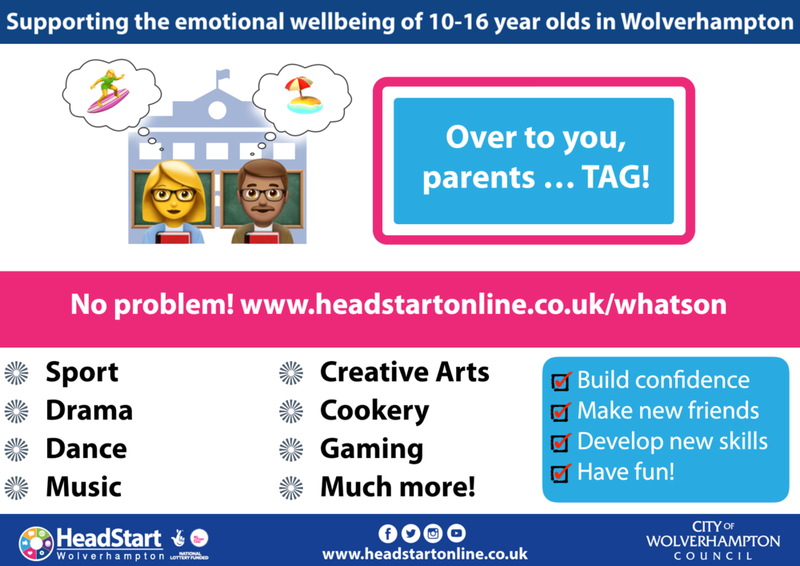 They include a range of free activities organised by HeadStart Wolverhampton and local community groups designed to support our young people and encourage confidence, positive emotional wellbeing and good mental health. WV Active's Summer of Sport starts on Monday across all three leisure centres, WV Active Aldersley, WV Active Central and WV Active Bilston-Bert Williams, offering free activities including badminton, tennis, squash, table tennis, family swimming lessons and fitness classes. Those who want to take advantage of the offer must be residents of Wolverhampton and need to register for temporary Summer of Sport membership for free via WV Active. Wolverhampton's Strengthening Families Hubs are holding Learning Through Play sessions for 0 to 9 year olds at their bases across the city, and there will be a number of takeover days in the city's parks for children and young people by organisations including The Way Youth Zone, which also a wide range of clubs at its School Street base. It's a Knockout! will be taking place at Ormiston SWB Academy in Bilston on 15 August, while young people and parents can enjoy the Krafty Kids Cafe at Bilston Methodist Church from 7 to 30 August. The church is also inviting people to develop new skills through crafts with 'Try it Tuesdays', find peace and calm with mindfulness, yoga and nutrition sessions on 'Wellbeing Wednesdays' and enjoy craft based therapeutic activities on 'Therapeutic Thursdays'. For more information, including a timetable of all the activities for children and young people taking place across Wolverhampton this summer, please visit Summer Activities.